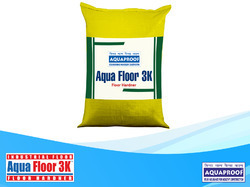 Pioneers in the industry, we offer aqua floor 2k and aqua floor 3k from India. Aqua Floor 2K is a grey powder made of special cement, non-metallic aggregates and activating chemicals. These are for use in industrial concrete floors to produce impact and abrasion resisting and dust free surface capable of withstanding oil, grease and industrial chemicals. They can be used as toweling grade (broadcast or dry shake on fresh concrete or as a thickness grade for incorporating in a total thickness of the topping. Aqua Floor 3K is a dry shake, metallic floor hardener with cleaned and graded iron aggregate in a high strength cementitious binder. It provides a dense, tough surface capable of withstanding the abrasion and impact loading which industrial and manufacturing floors are commonly subjected to. Excellent bond with base concrete. Resist penetration of oil, grease and many other liquids. Looking for Industrial Floors ?